It was cold this morning in West Michigan as my daughter and I headed out to another abortion protest. We arrived early to find about two dozen people already lined up in front of our local Planned Parenthood clinic. I offered a friendly greeting to the first group of young women, whom I presumed were Pro-Life. Then I noticed their signs! Most of their messages were too vile for me to place here. All reflected an extremely narcissistic view of life. But much worse than their signs was their endless banter and chanting. They never stopped ridiculing the prayers and songs of grace offered by those on the pro-life side. For two hours they mocked our message of life, while expounding on the benefits of their own message of death. 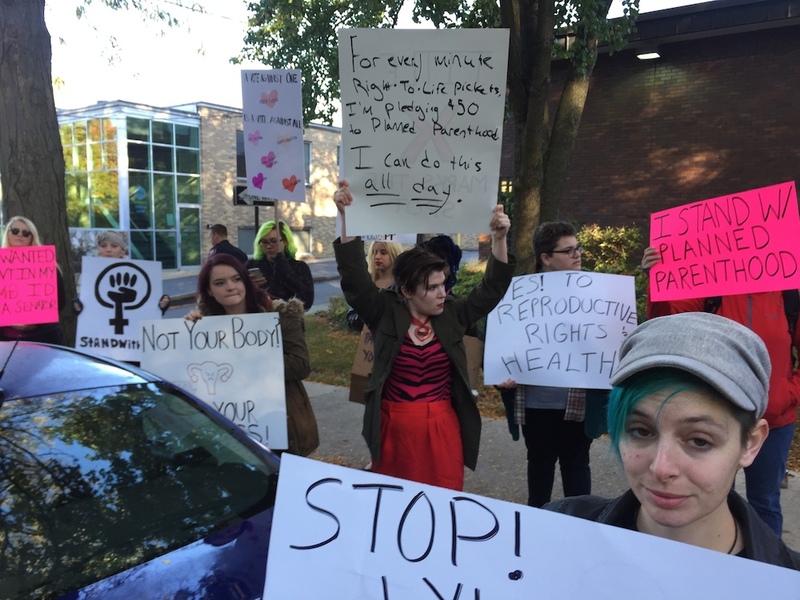 I spent most of my time standing in front of the vulgar crew, with my pro-life poster, facing their way, depicting two happy babies. The shady ladies didn’t appreciate that much. At one point I saw an opportunity to reach out to the African American church located nearly across the street. I had contacted the pastor previously, asking why they were not represented at these protests. They assured me that their congregation was pro-life, but this morning they were too busy with a meeting to stand with us. I pleaded with them to come and join us, sharing some examples of that morning’s especially egregious pro-abortion rhetoric. I had gone too far, and was told to leave the church property immediately! However, fifteen minutes later I was thrilled to see Pastor Spearman, and four other men from the church, walking up the sidewalk to our location across from Grand Rapids Michigan’s Planned Parenthood Clinic on Cherry Street. I shook hands and hugged each of those good men, thanking them for coming. The pastor attempted to share a few words with the crowd about the evil of abortion, but was shouted down by the pro-death she-goats across the street. Before the men left I was able to ask for an interview, results soon to come. This entry was posted in abortion and tagged abortion, fetal tissue sales, Planned Parenthood, Pro-Life, Right to Life. Bookmark the permalink.